The Intel Core i7-6700K is on many a PC enthusiasts' wish list, being top of the crop of current mainstream Intel processors and with the 'K' suffix signalling its overclocking friendliness. Out of the box with no overclocking this 14nm processor based on Intel's newest microarchitecture has 4 cores (8 threads) running at 4GHz, Turbo Boosting to 4.2Ghz. The Core i7-6700K has a TDP of 91W and draws around 1.3V at load in its default configuration. 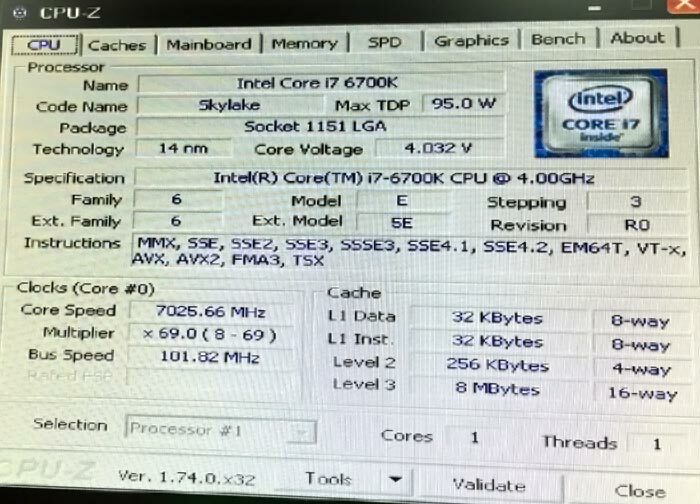 In the HEXUS review of the Intel Core i7-6700K we did a bit of air-cooled overclocking but nothing too drastic. We were comfortable running the processor at 4.6GHz using 1.3V and felt that was the best speed/voltage for long-term 24/7 stability. It is noteworthy that this overclock provided about 10 per cent performance increase in apps such as video encoders but brought little to the table in gaming performance. Thus the increase in clockspeed which bumped up power consumption from 99W to 156W and temperatures by over 20 per cent probably isn't worth pushing for in the longer term. 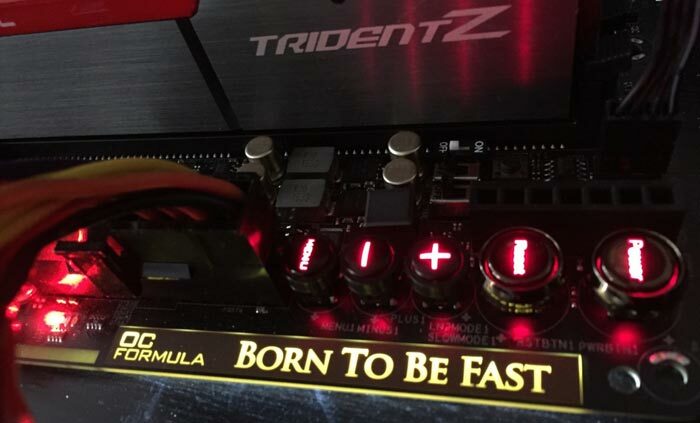 None of the above sensible considerations have much of an impact on competitive overclocking enthusiasts. PC Gamer reports that Hong Kong's Chi-Kui Lam recently managed to get his Intel Core i7 6700K processor running at a record breaking 7025.66MHz. 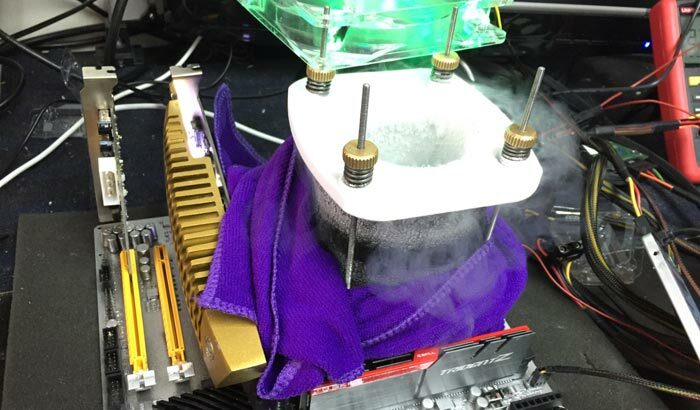 As is usual with overclocks of modern multi-core processors, only a single core was tasked (core voltage 4.032V) and lashings of liquid nitrogen was applied to keep the processor cool enough. Other system specs, as used by Lam to gain Skylake overclocking pole position, include the following; an ASRock Z170M OC Formula motherboard, a G.SKILL Ripjaws 4 DDR4 RAM memory module, a Plextor 256GB SSD, an Nvidia GeForce GT630 graphics card/towel radiator, an Antec 1300W power supply, and the system ran Microsoft Windows XP. Surpassing 7GHz with Skylake is impressive but world's fastest clocked processor record goes to the AMD FX-8370 which has been pushed as high as 8.723GHz. So 1 core at silly speeds but not usable in the real world as it needs liquid nitrogen. Hmm I'm sure I remember when over clocking was a thing. You know when it mattered. Kudos to Chu-Kui though that's impressive.